This guide explains how to take a test or survey in Blackboard. 1. To attempt a test find the test in your course and click on its name. 2. You will be asked to confirm that you wish to take the test. Click on Yes if you are sure. 3. You may be asked to enter a password. Your course instructor can provide you with this password. 4. The test begins from this point. The rubric will be displayed at the top of the screen. If a time limit has been set a clock will begin counting upwards from zero to the time limit. Note the clock counts upwards from 0 in the bottom right corner of your browser window. You will receive a warning before the time limit expires. Allowed: You may take this test as many times as you wish. Your most recent score will be recorded in the Gradebook. Not Allowed: You have only one opportunity to take this test. You will not be permitted to take the test again. This test must be completed now. It CANNOT be resumed later: You cannot reopen the test and restore your saved answer values. You should complete the test in one sitting. You may press the Save button at the bottom of the page at any time. This will save your answers, but not submit the test for marking. If you left the test and accessed it again at a later date or time your answers will appear for you, ready for you to complete the unanswered questions. Note that if the test has a time limit the clock will not stop if you save your progress and resume it later. Therefore do not use this feature with a timed test. The Save button allows a you to keep their connection / session alive by allowing you to save your work before submitting or just to save your test periodically. This is to prevent browser timeouts or internet connection timeouts. Multiple Choice questions require you to select one correct answer response from a choice of possible answers. Choose the correct answer by clicking on the radio button to the left of the correct answer. A Multiple Answer question is like a Multiple Choice question, except that there are one or more correct answers. You will not usually be told how many of the answers are correct. Select the answers by placing ticks in the boxes beside the correct answers. Note that all (and only) the correct answers must be selected in order to score points. True or False questions require you to decide whether a statement is true or false. Select the correct answer by clicking into the radio button to the left of the correct answer. An ordering question requires you to put several answer values into the correct order. The order could be, for example, procedural (e.g. step one, step two) or chronological as in the example above. To put the answers into the correct order use the drop down menus to the left to select the correct order. A fill in the blank question requires you to type a word into the text box in answer to the question above it. It may require you to complete a missing word from a sentence or answer a question. The answers are not case-sensitive, but must be spelt correctly. The test author may have allowed for common spelling mistakes or variations. A matching question requires you to match one set of values to another. You may be required to match text to text, picture to text, picture to sound and so on. Use the drop down menus beside each item on the left to determine with whichever item they match on the right. Note that a selection from the drop-down menu (e.g. A) may be the correct match for more than one part of the question. A quiz bowl question presents you with an answer. You have to type in the question. A jumbled sentence question requires you to complete a sentence, choosing words from a drop down list. 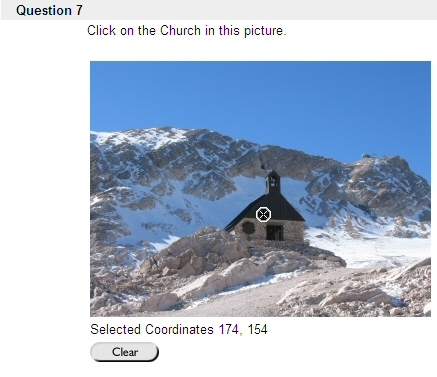 A hot spot question requires you to click on a specific part of a picture in order to answer the question. A fill in multiple blanks question requires you to complete a sentence or paragraph by filling in several blanks. A calculated formula question requires you to perform a calculation. 5. Once you have submitted your test you should receive a receipt screen confirming that you have completed the test. Having clicked on OK, you should receive your score and details of how long you took to complete the test. Note that if you exceeded the time limit a final score will not be given until the course instructor has reviewed your test. Below this you will be given feedback on your results. The extent of the feedback will vary according to how the test was set up by the course instructor. 6. To check your scores across any of your courses click on My Blackboard Scores from the Tools menu on the My University of Southampton screen. 7. You will be presented with a list of your Blackboard courses. Clicking on a course will provide a list of any scores you have achieved on the Blackboard course, as well as any grades which the instructor has entered manually. Clicking on one of your underlined scores will bring up a new screen reviewing any available feedback. If a score shows as an exclamation mark (!) it means that the test attempt requires manual checking and grading by the course instructor, this could be in the case of an attempt that exceeded the time limit, or a free text essay question which requires manual grading.